Our Reception Unit features an integrated pigeon hold system and a full depth flushed modesty panel. 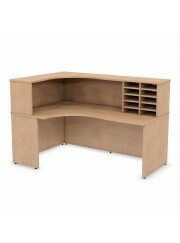 The unit is available in Light Oak, Maple or Beech. Our Bespoke Solutions team can also work with you to adapt or design and manufacture reception furniture which is tailor made to your requirements. Find out more about our Bespoke services.